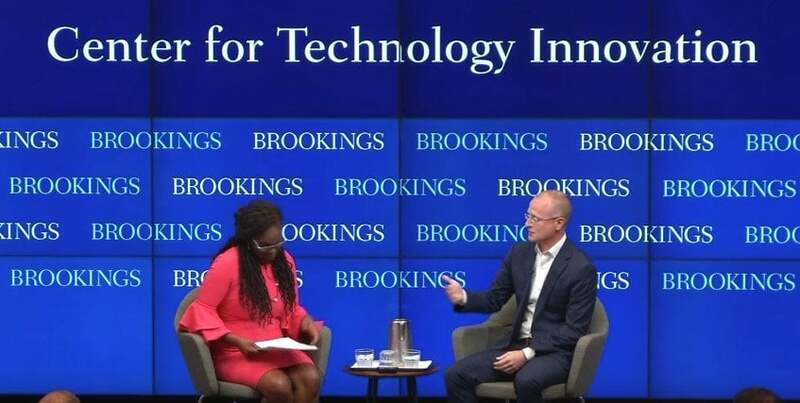 On June 26, the Center for Technology Innovation at Brookings hosted a fireside chat with FCC Commissioner Brendan Carr about the future of 5G. Thanks so much for having me and congratulations. Your position here and really appreciate the chance to get a conversation going with you on these issues. 5G is really a transformative technological change for communities across the country. Everyone's familiar with 3G and 4G. I think the best way to describe it for me is when you think about all these new cutting edge innovations that we're reading about and seeing about from connected cars to new remote healthcare applications IoT remote monitoring in terms of the industrial Internet of Things all these new interesting cutting edge innovations 5G is the upgrade to our wired and wireless networks that's necessary to enable all that innovation. We talk about it a lot from a wireless perspective but it's equally as much a wireline play as well in this sense you know 5G is going to involve about 80 percent of all new deployments are going to be what we call small cells and so they're not going to be you know these 100 foot 200 foot towers that put signals over 30 or 40 miles. They're going to be small cells that are going to be putting signals over blocks and so not only do you need a lot of capacity in terms of spectrum to do that we need a lot more wired infrastructure to connect all those new antennas as well. So I'm really excited about the technology and what it holds at this time to your other partner question. There's a lot of work we have to do on the regulatory front to make sure that the U.S. is what I call 5G ready because this is a very very different network deployment again it's not a relative handful of 200 foot towers. It's a 10 to 100 fold increase in small cells in our regulatory approach had been assuming that every new antenna is a 200 foot tower. So the cost the timeline the regulatory red tape was threatening to be the bottleneck that could slow US leadership in that space. So we've been systematically looking at that at the FCC to make sure the U.S. does win this race. I mean let's talk about that for a little bit so thinking vaccine said a couple of things I want to sort of unpack. So the assumption of 5G is this is said it's a wireless play. You said something. It's also a wired play right now. And why is that. Can you explain that to people why does a wired component that we're pushing to this small cell world. But you need high speed wired connections to all these small cells to carry that traffic. So what we talk about you know a 10 to 100 fold increase in the number of small cells. We also need many many miles of new fiber and other high speed connections to make the network function. And so I want to impact the second piece right making the U.S. fiber reading right. So there's a lot of reports that are out there. China Korea sort of beating in the United States when it comes to 5G rollout and I think I'm writing a piece on this I think a lot of that has to do with the fact that they get the applications of IoT you know machine to machine enablement etc. as the reason why they need faster networks. Can you explain. Like where do we fit. I mean China has already done trials. They are already testing you know they're freeing up spectrum which we'll talk about the moment but can you say why it's important that the U.S. sort of stay on top of this. Yeah. So the U.S. system is obviously very different regulatory and governance structure than China. A lot of other countries that we are in this race to 5G but winning this race is going to be critically important and at the FCC we're committed to doing that actually in pretty good shape right now. On the spectrum side we have freed up the FCC about four gigahertz more spectrum than China has in terms of this spectrum is needed for 5G applications and that's why it's so important that we're taking these reforms at the commission right now with better infrastructure deployment proceeding we did a big order in March that exempted small cells from certain historic and environmental procedures that were cure for these tall towers. Those are the steps that we need to take to win this race and I think we're actually in a good position right now if we keep the momentum going because there's lessons learned. We in the U.S. won the race to 4G. A lot of people view Europe and Japan as having led in 2G and 3G and we really made some progress on 4G and because of two things One we freed up more spectrum faster than other countries when it came to 4G use cases and we reformed are infrastructure rules including the ability to swap out 3G antennas or replace them with 4G antennas so we know the playbook for winning when it comes to next generation technology in the U.S. it's beating other countries firms are offering of spectrum and it's making sure that our infrastructure deployment rules facilitate the deployment. We did that for 4G and we're right in the process right now of replicating that for 5G but on a much more massive scale. But the thing about the infrastructure is let's go there for a second. I mean these small cells are sized pizza boxes from what I've seen and demos and it's going to put some more strain right on say needs to actually do the zoning and permitting process. I mean what the FCC I mean this is the FCC play is the federal.